transporting precious cargo and their owners across great distances. Aptly called "Ship of the Desert", these large mammals in adapting to extremely harsh conditions—cold, hot, aridity of deserts or semi-deserts, camels have acquired many special abilities and attributes. They can store energy in their humps and abdomen in the form of fat, enabling them to survive long periods without any food or water. It is little wonder then that Camels have come to represent these virtuous qualities – strength, diligence, adaptability, persistence, endurance and loyalty. With these traits, we can overcome tough and difficult times to emerge stronger and unharmed. Call upon the camel for strength, endurance and protection if you are faced with a potentially formidable path ahead. 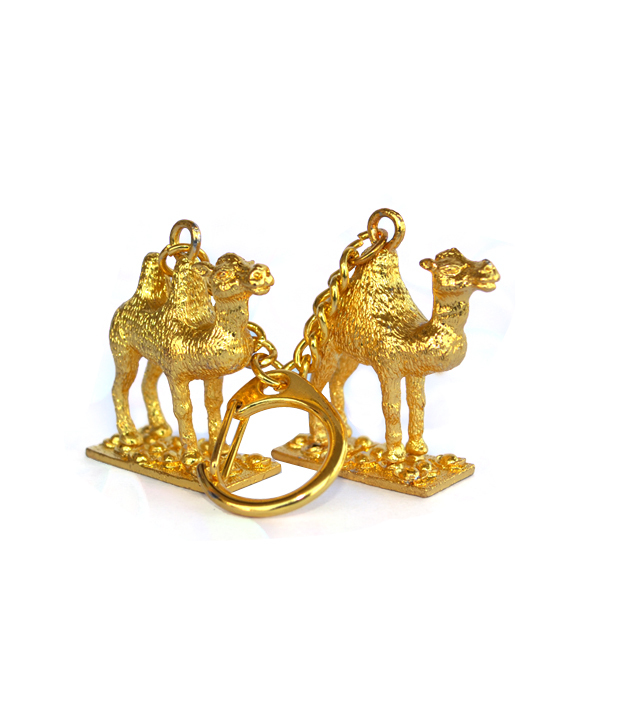 Carry the Pair of Golden Camel Key Chain wherever you go to help you in times of trouble so that you will come out not only unscathed but successful and blessed with good luck. The camel has the capability to smoothen your journey, whether physical, emotional or spiritual, as you make our way along the long path of life. Disclaimer: This Fengshui Product is Believed to bring about all the good things. We do not guarantee its success and are not responsible for any claim. Product colour may slightly vary due to photographic lighting sources or your Screen settings.